Brook Andrew is a Melbourne based artist whose practice is concerned with the politics of representation. Many of Andrew’s works explore how culture and identity are expressed within the context of archives and museum collections. This is often achieved through the re-presentation of archival material – especially photographic images – that have previously been used to constitute Aboriginal Australian culture within a Western colonial narrative. Possessed, a series of eight large-scale photographic montages made in 2015, represents another iteration of Andrew’s intervention into Australian archives and museums. 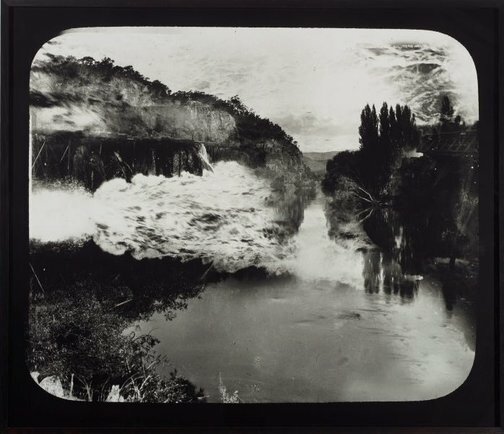 These montages are derived from a collection of late 19th century glass lantern slides of landscape vistas taken by Government and other official photographers and commissioned to present the Australian ‘wilderness’ in order to promote tourism. To Andrew, these images represent a European way of looking at the Australian landscapes and reinforce a colonial narrative of ownership. He says ‘the term possessed is firmly placed within the confusion of a psychological act of how dominant cultures manipulate power and history through the making and dissemination of photography.’ For Andrew, this idea finds expression in in the unrelenting presence of a horizon line which, he argues, represents a ‘dominance in the way of looking at other possibilities’. By digitally combining these found landscape scenes into montages that eviscerate the horizon line Andrew subverts the history of dominance embodied in these images. Dead Ringer , Perth, 2014.